In previous blog posts we explained how the UBS Willow Fund completed its spectacular multi-year collapse in 2012 largely as a result of its leveraged portfolio of credit default swap (CDS) contracts. See Credit Default Swaps on Steroids: UBS’s Willow Fund and Willow Fund’s Hedging, Investing and Speculating in Distressed Debt With Credit Default Swaps. Through these CDS contracts, the Willow Fund made a large, highly-leveraged short bet on credit risk contrary to its repeated SEC disclosures. In this post, we will explain the significance of the CDS premium that the Willow Fund paid each year in causing the losses suffered by investors. The Willow Fund suffered substantial losses on its common stock and corporate bond and loan portfolio in addition to its CDS losses. The relative importance of credit default swaps on the Willow Fund is not readily apparent from the SEC filings because the bonds and loans received coupon interest while the Fund paid out over $120 million in premiums on its CDS contracts. Similarly, the relative significance of CDS on corporate bonds versus CDS on sovereign debt is obscured by the differences in CDS premium the Willow Fund paid across the different types of reference obligations. Table 1 reports the estimated capital losses suffered by the Willow Fund on CDS contracts and all other investments – mostly common stock and corporate bonds and loans - estimated from the fund's quarterly holdings reported on SEC filings from 2007 to 2012. * We estimate that market value gains of $22,635,151 on the swaps partially offset $115,527,918 in losses on other investments. Looking only at the capital losses derivable from the Fund’s quarterly holdings it appears that the CDS contracts were profitable and that common stock and corporate bonds and loans were responsible for the losses from 2007 to 2012. The Willow Fund however received $20 million in interest and dividends on the stock, bonds, loans and other investments and paid out $136 million in premiums on the CDS contracts. Thus, properly reckoned, the CDS contracts accounted for $116 million or 55% of the $210 million in losses the Fund suffered from 2007 to 2012. Everything else in this distressed fund accounted for only $94 million or 45% of the losses. A similar phenomenon obscures the relative significance of CDS on corporate debt versus CDS on sovereign debt. If we only look at capital losses derivable from the Fund’s SEC filings, it appears that two thirds of the CDS losses in 2012 came from contracts betting against the credit quality of sovereign issuers like France, Germany, Ireland, Mexico, Spain, Sweden and the United Kingdom. This is misleading because the CDS contracts on corporate bonds required much higher premiums (2.38% on average) than CDS contracts on sovereign debt (0.82% on average) and CDS contracts on state and municipal bonds (0.36% on average). You can find the annual CDS premium the Fund paid on its contracts in a schedule near the end of each annual and semi-annual report. Consider the Willow Fund 2008 Annual Report which can be downloaded here. 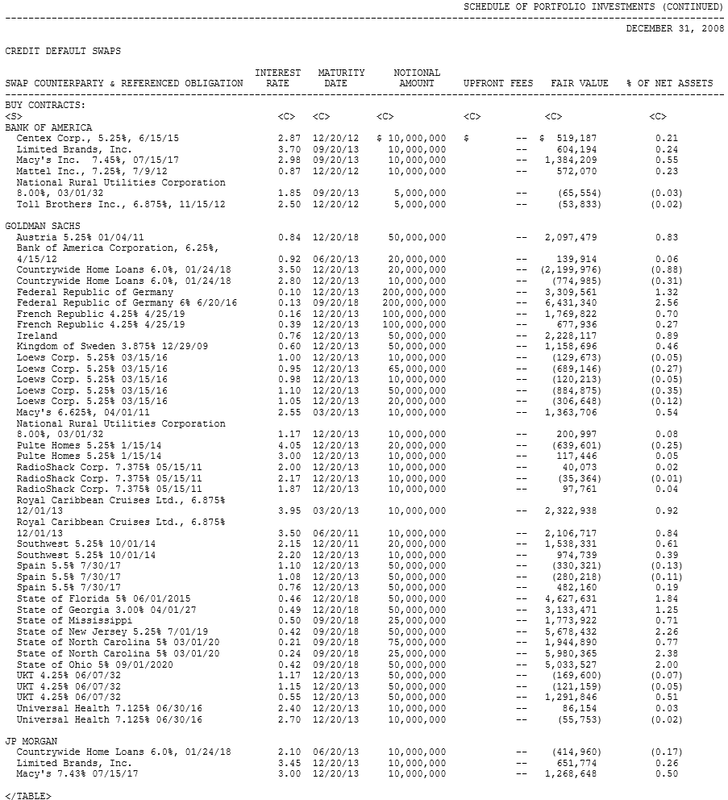 I have excerpted the first part of the CDS Table which starts on page 22 of that filing in Figure 1. The second column labeled “Interest Rate” is not an interest rate but rather the annual CDS premium the Willow Fund committed to pay on the notional value in the fourth column for the term of the CDS contract. Focusing on the contracts with Goldman Sachs, you can see that the Willow Fund paid as little as 0.1% to insure German sovereign debt and as much as 4.05% or 40 times as much to insure Pulte Homes debt. 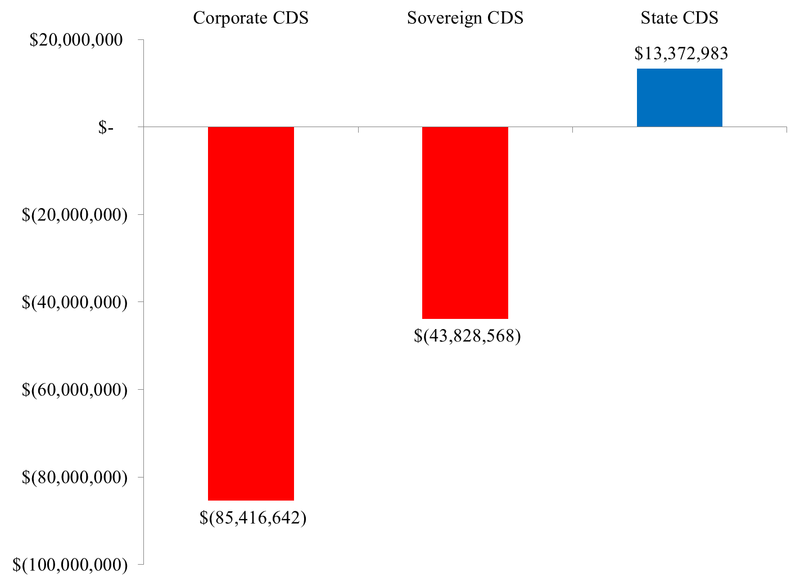 Table 2 reports a breakdown of capital losses on CDS contracts by type of underlying debt, corporate sovereign and municipal from 2007 to 2012. The Fund paid $85.1 million in CDS premium on corporate debt versus $48.0 million on sovereign debt over the 2007-2012 period. If we include the high CDS premiums the Willow Fund paid, over the entire 2007-2012 period, the Willow Funds’ $85.4 million in losses from CDS contracts on corporate debt was nearly twice as much as the $43.8 million in losses from CDS contracts on sovereign debt even though it purchased CDS contracts on twice as much sovereign debt as corporate debt. 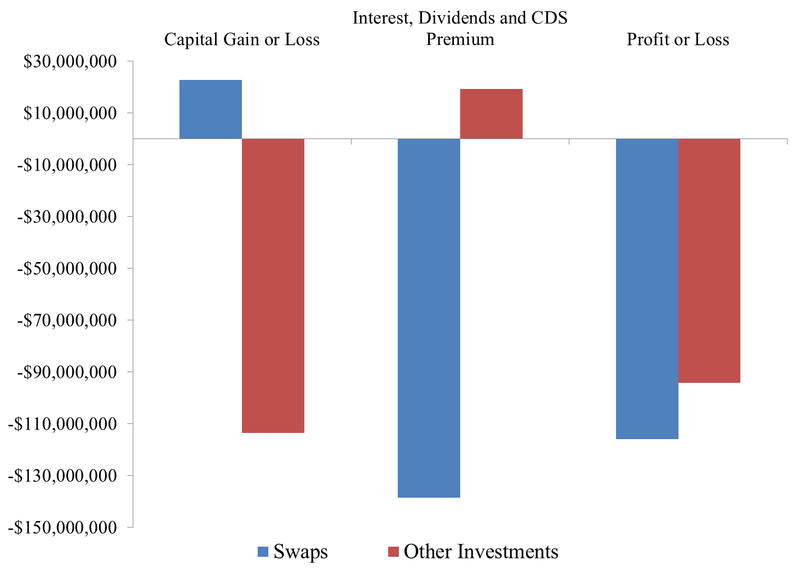 Even looking at 2012 in isolation, the proportionate losses on the corporate CDS were greater than on sovereign CDS so replacing the sovereign CDS with corporate CDS would have increased the Fund’s losses in 2012 as well as over the entire 2007-2012 period. We’ll have another blog post on the Willow Fund next week in which we compare the losses investors suffered in the Willow Fund to investors’ experience in distressed debt more generally. We also compared how Willow Fund investors fared compared to the general partner which was a UBS affiliate. * We estimated the capital gains and losses as the change in the reported market value per unit multiplied by the minimum number of units held at the beginning or end of the quarter. We estimated the CDS premiums paid as the CDS rate multiplied by the average notional value of each contract at the start and end of each quarter. The complete details of our estimation are available in our upcoming working paper on UBS’s Willow Fund.